Pretty much everyone knows Rock, Paper, Scissors. Some even know the extended version with Lizard and Spock thrown in. So a game where certain hand gestures are required shouldn't be anything new to people. 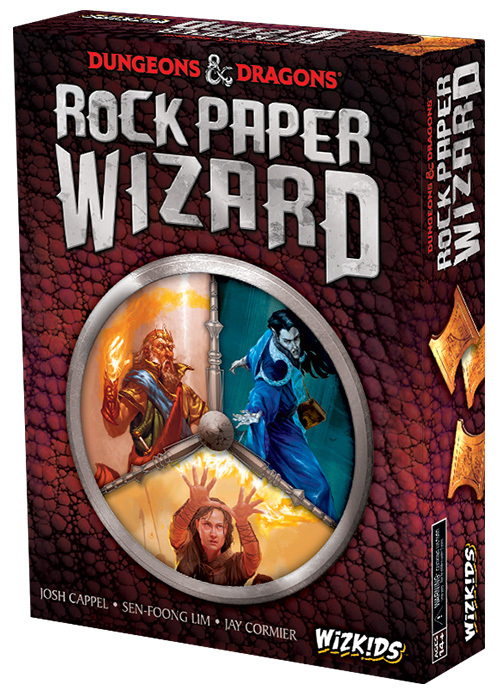 WizKids is getting themselves in on the action with Rock Paper Wizard, a new card game in collaboration with Wizards of the Coast. In the game, players are wizards looking to collect gold coins. You do this by casting spells at the opposing wizards. Each spell has a different hand gesture associated with it. Each round, someone will call out, "Rock, Paper, Wizard!" at which time each player will cast a spell at one opposing wizard. Each spell has a unique ability, from moving players toward the exit (metaphorically, that is), or closer to the hoard of gold, or manipulating coins your opponents might have gotten. The game is for 3-6 players and will be available in January.